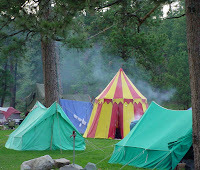 Back from a weekend in the Black Hills of South Dakota at an SCA event called Quest for Camelot. As usual I forgot to take pictures, but here's one I took at the site two years ago. Proof copies of The Ash Spear arrived while I was gone - it's looking good!